Speaking as a developer, Opera’s version numbering seems sensible. Unlike Chrome and Firefox’s rapid updates or IE’s ridiculously sedate pace, Opera normally release a new browser once or twice a year. The version number is incremented when it’s right to do so. The differences are subtle, but 11.5 sports a lighter, sleeker and cleaner look. It’s easier to concentrate on web page content and Opera claim it’s faster. I like it. Perhaps the biggest change is speed dial extensions. Rather than simply providing quick access to favorite sites, extensions can add dynamic information to the Speed Dial page. Essentially, it’s a personal home page or set of desktop widgets on the start-up screen. A few extensions will be available today including Read It Later, Webdoc and StockTwits. To help you manage your favorites and extensions, a new flow feature provides an unlimited number dials. Sizes are automatically adjusted for your screen or you can specify your own zoom level. Password sync has finally arrived in Opera Link. The browser implements strong security so passwords are encrypted on the client using your Opera account password and a randomly generated key. No password is ever stored or transmitted as plain text, so that should reassure those affected by the recent high-profile security breaches experienced by Sony, Nintendo, the CIA and other organizations. For more information, see Security of synchronized passwords with Opera Link. The developers have fixed thousands of bugs and upgraded the rendering engine. It should result in a 10-15% speed improvement for CSS and SVG rendering. The browser has always been on the cutting edge of HTML5 and it now supports Session History and Navigation, the W3C File API, classlist and the <time> element. 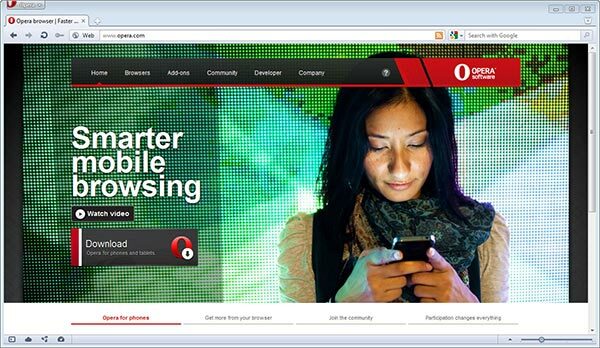 Opera 11.5 builds on what was already a great browser. If you don’t have it installed, head over to Opera.com and become one of the many thousands featured on their live download counter. What do you think of Opera 11.5?